Well hello there! We are getting towards the end of our Makers Month here, booooooo. So I thought a little selection of other DIY's that H particularly has been really wanting to make recently. Probably all to do with having my own place and starting to run out of money to do all the fun stuff. I found all these great DIY's online and so I will share where I found them. From Top left; Fall for DIY is definitely a favourite of ours to look at for inspiration for all kinds of tutorials and this Copper Magazine rack does not disappoint! It's the colour and finish of the season, copper and makes a great place for all the Mollie Makes and Simply Sewing magazines that seem to stack up! Magazine addict anyone! Top right is over to Flossie Teacakes and this cool rope bowl. We all need lots of storage space and why not make this great bowl to match your decor and of course have some fun in the meantime. I can see fruit bowl, key bowls and just bowls for bowls sake in my future. Bottom left, well just look at it! I found this amazing succulent dish on Little House on the Corner. We all know that succulents are just the coolest thing ever and that we need somewhere to put them. I love the idea of having a little garden of succulents, especially as I live in a flat and don't have a garden of my own. Now, just to not kill them! Lastly, but by no means least I found this tutorial on Hester's Handmade Home to turn a book into a Tablet holder. I met Hester briefly at a B&Q Masterclass with Charis Williams a few weeks ago and have been a little obsessed with her tutorials and You tube Channel. She also has a book called Furniture Hacks, which has some great ideas. I think that might be enough to get me started, I also have some Valspar paint from the B&Q masterclass event that I am itching to paint everything I own with! 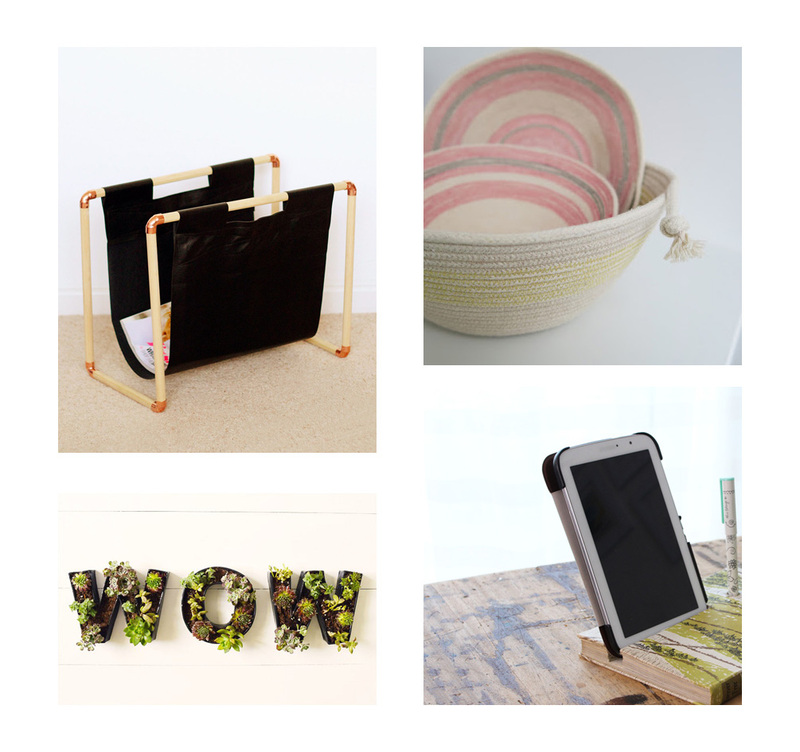 What's on your wishlist to make at the moment, have any of these DIY's given you an idea of what to make next? Let us know in the comments below if you have made any of these or there is something you have on your wishlist to make. Check out our Pinterest board DIY Dreams for some more inspiration.